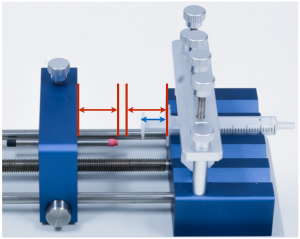 Chemyx syringe pumps can generate a significant amount of linear force. While this is extremely useful for dispensing viscous fluids at higher flow rates, this linear force can also potentially damage the syringes during infusion pump operation. One source of potential damage of a syringe may occur when the plunger of the syringe is complete depressed, and the pusher block is still pushing against the syringe. Depending on the material of the syringe (i.e., glass or plastic) and the thickness of the plunger, the force from the pusher block could bend, distort, or just break the syringe. To protect against this potential problem in infusion pump operation, Chemyx syringe pumps use safety collars (Fusion 100, Fusion 200, Nexus 3000, and Fusion 4000) and safety bar (Fusion 400, Nexus 6000 and Fusion 6000) to physically stop the pusher block before it can completely depress the syringe plunger. When a pusher block hits the safety mechanism and can no longer move forward, the infusion pump will cease operation, emit a long beep, and enter pump-stalled mode. Adjusting the safety collar requires the use of the hex key, which is conveniently stored on the back left of the pump, typically right above the power switch. Loosening the hex screw on the safety collar allows for the collar to be slid freely along the guide rod and then securely tightened at the desired position. The position of the safety collar should be set slightly further from the block holder than the top of the syringe plunger when fully depressed. Some of the Chemyx syringe pumps use a safety bar instead of a collar to limit the distance the pusher block may travel. 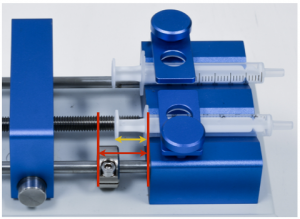 By loosening the safety bar clamp knob on top of the pusher block, the safety bar can be slid left or right. The safety bar should be set such that the length of the bar exposed on the right side of the pusher block is longer than the distance from the top of a fully depressed syringe plunger to the edge of the syringe-holder block. Once the safety bar has been set to the proper length, tightening the safety bar clamp knob will keep the bar from moving.